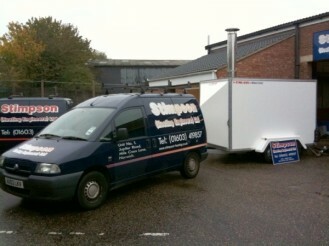 So services can be maintained while refurbishment or repair works take place, and during times of unplanned emergency shut downs, Stimpson (Heating Engineers) Ltd are able to offer our customers a temporary boiler service. Our mobile temporary boiler plant is housed in a covered trailer and has recently been refurbished with a 100Kw Hamworthy gas or oil fired Boiler. 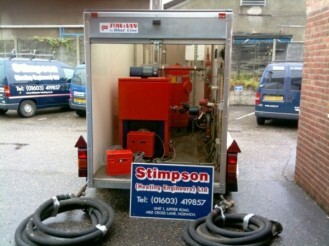 We are also able to provide a temporary oil tank. The mobile boiler plant can be installed complete with unvented indirect hot water cylinders if required to provide domestic hot water supply. It has been successfully used on projects at Schools, Colleges and Homes for the Elderly. Our engineers can adapt, install and commission the boiler plant to meet customer requirements so please do not hesitate to contact us if we may be of service.